Recession talk decreased slightly again in April. 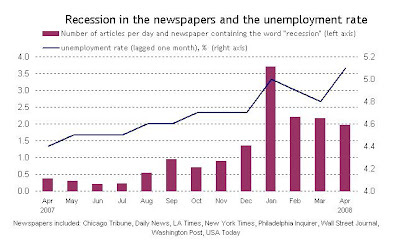 According to an index which includes eight newspapers, each publication included an average of 1.96 articles per day using the word “recession,” down from 2.16 in March and significantly below the level of 3.70 in January (see chart 1). The decrease occurred in spite of the continued softening of the job market in March, which was known the first week of April. The release of the first-quarter growth of GDP and the meeting of the FOMC committee, which might have generated some R-talk, occurred on the last days of the month, so their impact on R-word statistics probably straddled April and May. 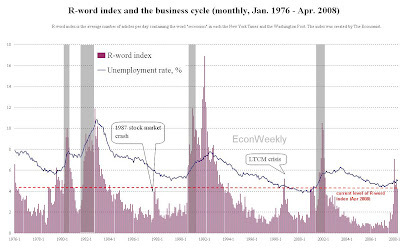 In spite of the diminishing buzz, the current level of talk is still consistent with an economy in recession, judging from historical trends (see chart 2).